Solubility & Equilibrium • The beginning XY(s) ==> X+ + YAs time continues the [ions] begins to increase. Solubility & Equilibrium Constant for Solubility-Ksp = [X+]x [Y-]y 2) It doesn’t matter if you have stuff on the bottom. Ksp Calculations The solubility of copper (I) bromide is 2. 0 x 10 -4 mol/L at 25 C. Calculate Ksp. Ksp Calculations – Your Turn • The solubility of silver phosphate is 1. 60 x 10 -5 M. Calculate its Ksp. Ksp Calculations – Your Turn • The Ksp of mercury (II) sulfide is 1. 6 x 10 -54. Find its molar solubility. Ksp Calculations What does it all mean? According to Ksp, EVERYTHING is at least very, very slightly soluble. Looking at the Ksp can help you figure out the solubility of compounds compared to each other – with a couple key rules about doing it! Ksp Calculations What does it all mean? 2) If the salts break into different # of ions, you can’t just look. Must calculate. Physics of Semiconductor Devices Lecture 6. 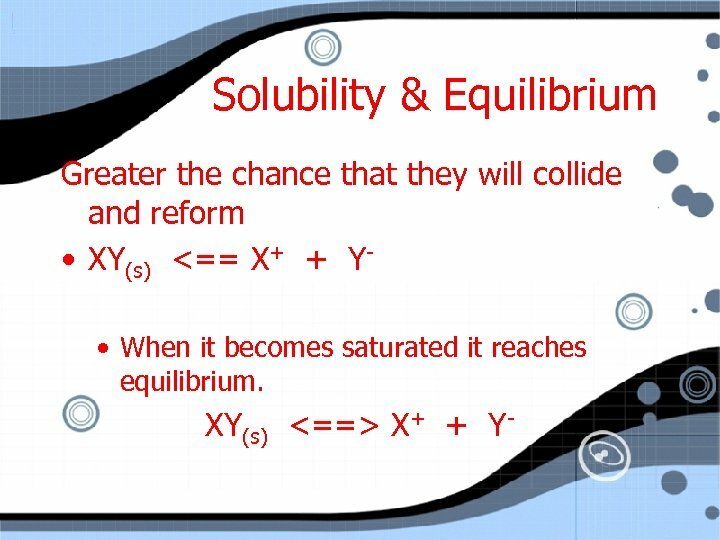 1 Market Equilibrium Topic 3 Source: masterminds.